Here are the top reasons more people are turning to backyard chickens. Chickens make great pets. They have personality galore, and they're extraordinarily easy to care for. They're bright, funny, quirky, friendly, loving little balls of feathers-and they're entertaining, too. When you have a flock, you'll find they have their own friends, their own cliques, their own favorite nests. Chickens come in such an array of colors, patterns, shapes, and sizes that some of them look more like exotic tropical birds-or even alien life-forms-than farm animals. Keeping chickens is a lifestyle choice; you keep chickens if you want to try to live in a more sustainable way. Having chickens helps fulfill a positive, back-to-the-farm way of living that's about becoming more sustainable. It's also a way to celebrate local, slow food, and reestablish a constructive connection with your neighbors and your neighborhood. Raising chickens allows you to have more control over the type of food you put on your table. You want organic? You want non-GMO? You want cruelty-free? These choices are all yours to make when raising your chickens. Chickens will eat your table scraps and convert them into eggs on the one hand, and fertilizer on the other. If you grow vegetables or flowers, you'll find that composted chicken manure is great for your home garden, adding organic matter and nutrients to the soil. Plus, chicken manure from layers tends to be relatively high in calcium, which is helpful for plants, warding off blossom-end rot on tomatoes, for example. Chickens will cut down on the number of insects in your yard. 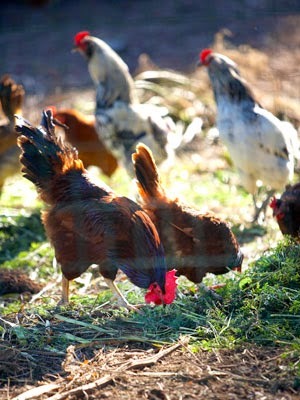 Anywhere chickens are allowed to forage, they'll snap up spiders, ticks, beetles, grubs, worms, grasshoppers, and more. They love to dig through lawn clippings and yard waste, too. The eggs from hens raised with access to your backyard will be tastier and more nutritious! Research shows they're not only higher in omega-3s, beta-carotene, and vitamins A, D, and E, but they're lower in cholesterol and saturated fat. They taste better, too. It's something you can see: All that extra nutrition gives backyard eggs a dark orange yolk-not the pale yellow color you see in store-bought eggs. You'll be eating really fresh eggs—sometimes just minutes old-as opposed to the eggs you get in a grocery store, which can be 6 weeks old or more. You'll be giving your children positive values. Just as with other pets, keeping chickens can help kids learn about responsibility. But because chickens give back in such a tangible way-eggs!-your kids can also learn about reciprocity and how the care they provide impacts their pets directly. Once they taste the eggs, they'll also come to learn that store-bought isn't always better. Some things are worth doing yourself. You'll have control over how humanely your wonderful egg producers are treated—and how healthy and clean their environment is. Chickens are so easy to care for. No walking, no pooper-scoopers, no grooming, no boarding when you go away; they won't scratch up your furniture or chew your favorite slippers.